Are you searching for LIC AAO Syllabus PDF? Then, you are at the correct place. The latest LIC India AAO Syllabus and LIC AAO Exam Pattern 2018-19 are provided here. Therefore, you can check and download LIC AAO Syllabus & LIC AAO Exam Pattern 2018-19 from this page. We have also provided LIC AAO Previous Papers here for the reference purpose. Hence, Aspirants can check and download LIC AAO Previous Papers with answers. LIC has invited online applications from all the talented and passionate citizens of India to the post of Assistant Administrative Officer (Generalist). The LIC is going to fill a various number of vacancies. 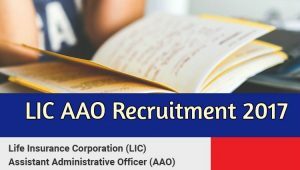 Hence, the interested candidates can check the Eligibility Criteria in the official notification and apply for the LIC AAO Recruitment 2018 if eligible. Therefore, all the applicants must start their preparation without wasting their valuable time. To make your preparation easy and efficient, we have provided LIC AAO Syllabus and LIC AAO Exam Pattern 2018-19 here. So, download LIC AAO Syllabus & LIC AAO Exam Pattern 2018-19 and crack the job in LIC. LIC AAO Syllabus and LIC AAO Exam Pattern 2018-19 have been updated here. Hence, the candidates who applied for LIC AAO Recruitment 2018 and looking for LIC AAO Syllabus & Exam Pattern can easily access it from this page. The individuals must prepare for the LIC Exam 2018 by following the LIC AAO Syllabus. Since through LIC AAO Syllabus 2018, you can know the important topics that need to prepare for the LIC Online Exam, thereby your preparation also becomes easier. Visit our website Recruitment Hunt daily to get more latest updates regarding all Government Jobs, Syllabus, Previous Papers, etc. The LIC of India Online Exam consists of 160 objective type multiple choice questions from Reasoning, GK, Computers, Aptitude, and English topics. The overall paper is organized for 300 marks. Check the above table for subject wise marks and questions. The complete topic wise LIC AAO Syllabus is provided below. Computer Software & Hardware etc. When will be the opening date approx to apply lic aao application forms. I am studying btech final year can I apply for this ??? I am doing BCA Degree now and i am going to complete it and get my degree certeficate in June 2018 so, Shall i apply for LIC AAO post this year through online?